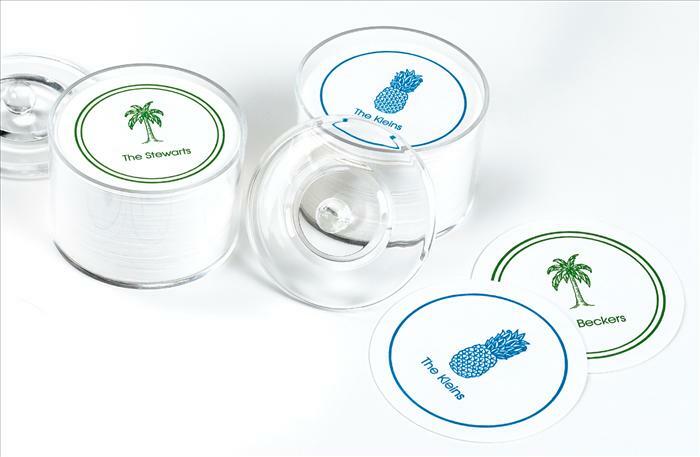 Description: For those breezy summer soirées you'll need our new Palm Beach Coasters. 100 heavy paperboard coasters personalized with your family name, come with a matching border and optional clear acrylic holder with lid. Choose the Pineapple or Palm Tree icon printed in your choice of Lime Green, Bimini Blue, wine, gold, silver, red, navy or hunter ink. Specify exact phrase or name. Font only as shown.